Cook pasta in plenty of salted boiling water, according to package instructions, for approx. 5 – 7 min. until al dente. Drain, save some pasta water and set aside. Finely chop parsley and garlic. 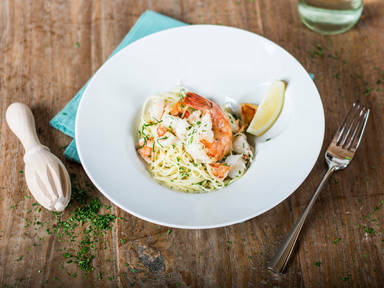 Heat up some olive oil in a frying pan and sear shrimp for approx. 3 – 4 min. until opaque. Add garlic and sauté for approx. 2 – 3 min. until fragrant. Deglaze pan with white wine. Stir in cold butter to bind the sauce. Season with salt and pepper. Toss cooked pasta briefly in sauce. Add lemon juice. Stir in chopped parsley and serve in deep plates.